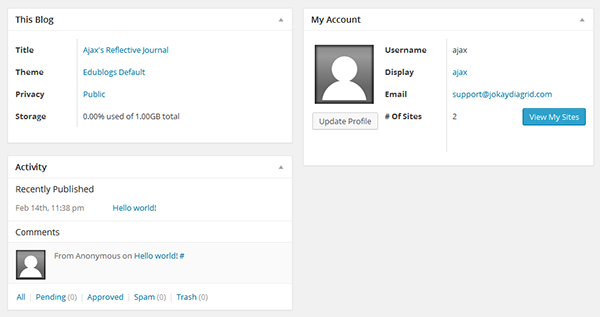 The first screen you see when you log into your blog is called the Dashboard. Your dashboard provide a quick overview of what’s happening with your blog, as well as supplying tools to navigate to other areas of your Administration panel. 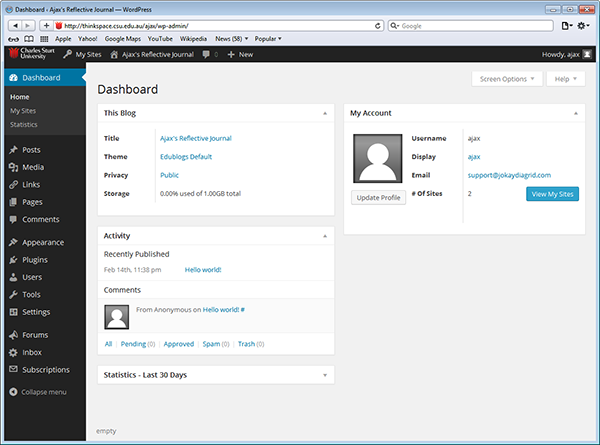 The main area of your dashboard is made of your main navigation on the left hand side and This Blog, My Account and Activity modules on the right. 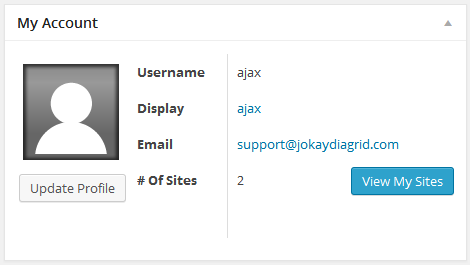 To navigate to a new screen just hover over the item in the admin bar and then select the desired option. 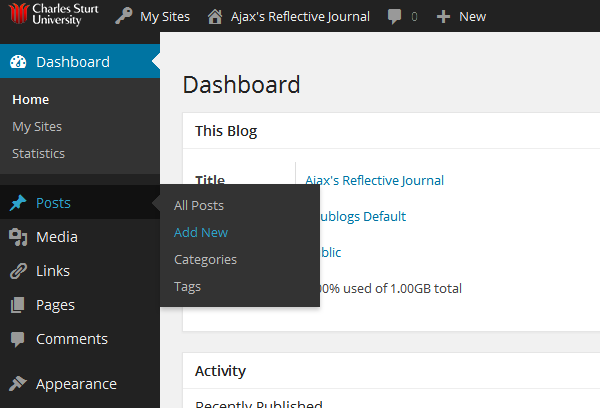 The dashboard modules are designed to give you an overview of your blog and account. These modules can be moved by left mouse clicking on their title, dragging to the new location on your dashboard and then release your mouse button. You can also expand and collapse these dashboard modules by left mouse clicking on their title bar. This Blog module provides a quick overview of your blog title, theme, privacy, and storage space left (for uploading media). Clicking on an option in your This Blog module takes you to that panel where you can update that information. For example, clicking on your current privacy option takes you to Settings > Privacy where you can change your privacy options. My Account module provides a quick overview of your account such display name, information on the number of blogs you manage, the number of blogs you own, manage or are subscribed to. Clicking on an option in My Account module takes you to that panel where you can update that information or manage your account. For example, clicking on Manage Blogs takes you to Dashboard >My Sites where you can easily manage all pending comments and posts. 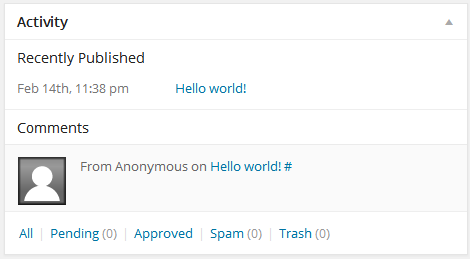 The Activity Module displays recently published pots, pages and comments your blog. Clicking on recently published posts or pages titles allows you to quickly go to the editing window to make changes or updates. Hovering your mouse over the comments brings up five action links which makes it easy to Approve/Unapprove, Edit, Reply, Mark as Spam, or Trash Comments directly from your dashboard. For example, clicking the Reply action link brings up a form that lets you reply to comments from your dashboard. The Screen Option button located at the top right hand side of your administration panel can be used to customize what is displayed and how it is displayed on that screen. You can use the Screen Option button to change the number of columns and hide modules on your dashboard (when you unselect an item this hides them).